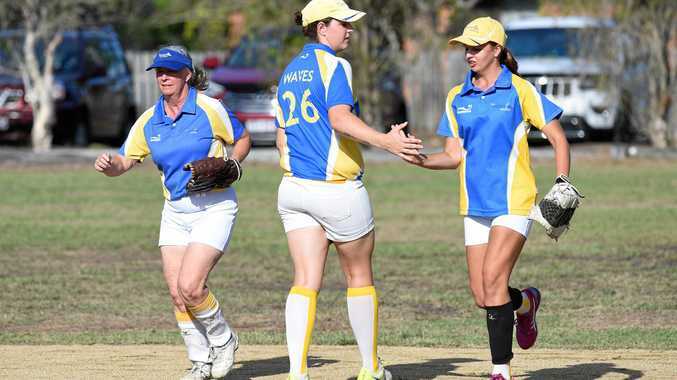 SOFTBALL: The Waves have etched themselves into history in the Hervey Bay Softball Association competition. The side became the first Bundaberg team to win a senior A-grade competition, beating Brothers 10-1 in the women's final on Saturday in Hervey Bay. The Waves got on top of the young Brothers side to lead from start to finish, taking advantage of players from the opposition that had to play two games in one day. "They had a half hour break, which made it very tough for them (Brothers),” The Waves president and winning player Lee-Anne O'Leary said. "This is the biggest margin we've won by all season. O'Leary said while the fatigue of the opposition was a factor, the team's fielding helped as well. "We had 12 hits and hit very well and we made only one error in fielding,” she said. The win wasn't the only one for The Waves on the day with the Under-14 side claiming the title with a 20-5 win over the Terrors. Hayley Simmons was named as player of the match with Connor Pashley also impressing. Brothers United president Jan Law said it was disappointing to lose but was confident the developing side would learn a lot from it. The competition is expected to be back next year.